Bubbly. Sparkling Wine. Cava. Champagne. Call it what you will, but let me introduce you to happiness in a bottle. If you save this incredible fizzing beverage for special occasions only, I highly suggest that you reevaluate your life rituals. My best girlfriends and I drink more champagne than anyone else I know: this is a title that we are ecstatic to hold. Yes, weddings and New Years celebrations are worthy of champagne toasts, but in my opinion- any time spent with people that you love is deserving of a bottle of Bubbles. These cupcakes are a tribute to my best friends. Many of which live super far away from me now. They are a tribute to the multitude of times we’ve chosen brunch restaurants based solely upon their bottomless mimosa special. They are a tribute to our day spent in Ft. Lauderdale/ Miami before our cruise to the Bahamas. They are a tribute to our recent trip to Vegas where the bartenders at a restaurant in Paris made us the most delicious champagne concoctions ever. They are a tribute to all of the crazy-hilarious-amazing memories that we’ve made over the years. Cheers to you, ladies. I’ve made you some cupcakes. First and foremost: pop that champagne bottle and make sure it tastes good. This immediately makes baking more fun; this immediately makes baking more difficult. Preheat oven to 350. Prepare two cupcake pans with your favorite liners. *I don’t claim to be an excellent baker: i’m working on it though. In the meantime, I am trying to follow the rules. Room temperature butter is important to cupcakes because it allows air to be beaten into the batter resulting in fluffier cakes. [ Hence why cold butter is used for pastries that are desired to be flakier: pie crusts, scones etc] Here is how I impatiently brought my butter to room temperature via steam-from-the-dish-washer-during-the-drying-cycle. Do as I say, not as I do? In a second bowl: beat eggs whites until stiff peaks have formed: fold the egg whites into the batter. Cream butter and cream cheese until combined and fluffy. Add sugar in small batches until desired consistency is reached. Add in the orange juice, champagne, and zest until it tastes delicious. 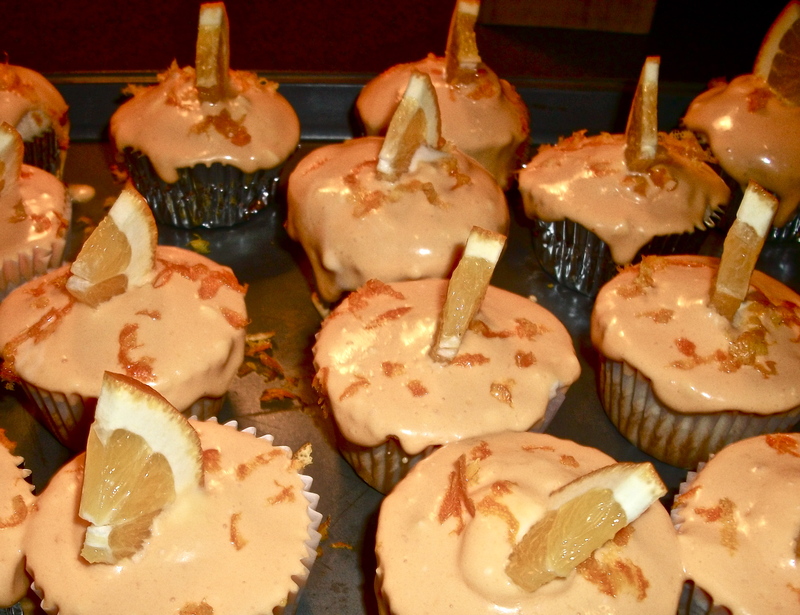 I added some orange color to the frosting to make them a bit more festive. Frost when cooled. Decorate with zest and orange wedges. 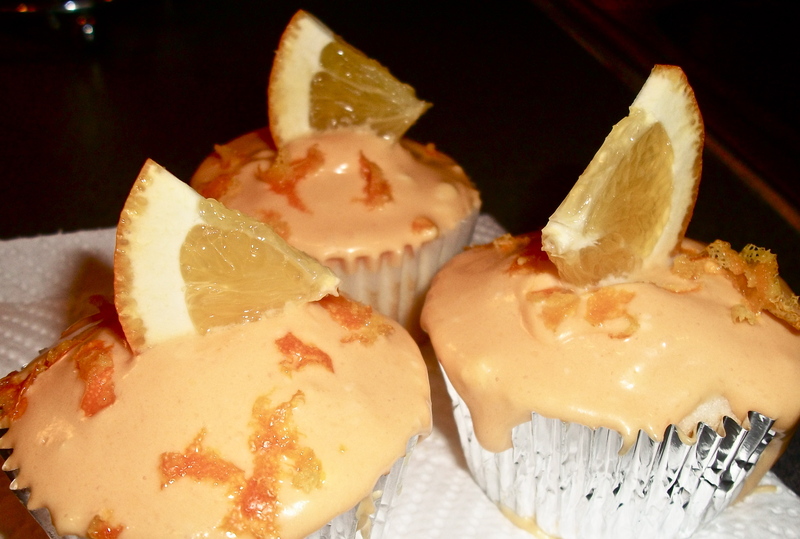 [When my frosting was finished – I decided to experiment with it bit- adding more champagne, of course, and whatnot. I ended up thinning it out a little more than I desired, which is why it appears to be running over the sides.] Regardless, they are delicious. Especially served with a mimosa. There are four sticks of butter involved in this recipe- you didn’t really want to know, did you? I especially like tasting to make sure the champagne is good!